An exciting event for horror fans returns for a second maddening descent this September 22 and lasts for 3-days, in Iselin, NJ at the Renaissance Woodbridge Hotel all for treats and tantalizing joys of what the genre many grew up with stills hold true passion. In NJ a state home to creations such as Friday the 13th and Jason to Toxic, and a place where other cons exist, this one stands apart as it truly captures the love of the fans, where even a person who knows no one can still find others just like them, their style without the judging. Created by fans, Ryan Scott Weber (a filmmaker and producer, in other words a DIY horror creator), Comic Book Men Producer, and pop culturist Rob Bruce, with the intention of building a fresh conceptual design catering directly to new and diehard fans that thoroughly support a constant critically slammed genre for many ills. When a young convention like this holds its second con, in the same year (March 31 to April 2) and moves to a larger location, it spells a positive message. Besides this time, reunions surround the essence of this event. Now, the fans know and recognize that the reunions once mainly for the major established franchises, now extending too many cult following films, such as Night of the Demons (1988). This movie directed by Kevin Tenney who will available for autographs, along with Linnea Quigley, Alvin Alexis, Amelia Kinkade, Cathy Podewell, and Allison Barron just to name one of four reunions. One wonders of the importance and significance of these latest ripples in the conventions, simply for the dedicated fans which to have all the signatures or photos with film stars they grew up with and now with the deaths of George Romero and Tobe Hooper. By the way, those other reunions included The People Under the Stairs, Cabin Fever, and Pretty Fine Things. Therefore, with even more vendors from book authors to the oddities and numerous artists, like Joel Robinson and now this year aspiring filmmakers with their indie films tables include make this a must visit on the circuit for any horror fans, gather together. Hence, time to make your own delicious nightmares for this Halloween season by venturing forth and unleashing your demons with the a cosplay contest to having a wondrous adventure meeting stars, mixed with some shopping and of course a full onslaught of a film festival covering 3-days of 35-short films and 8-feature films! 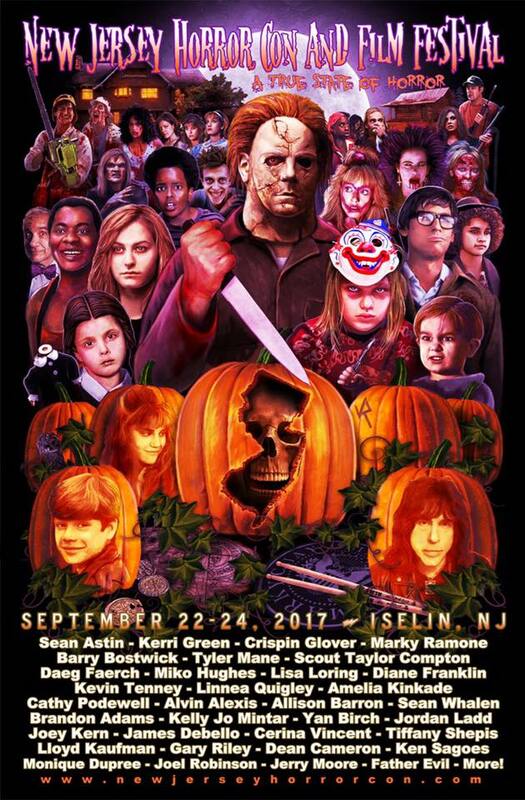 Lastly, all the tables and the entire Hotel is completely sold out, and event of taking place during a table in which some say the world supposedly ends on September 23, 2017, fret not fans and fiends Father Evil will protect us, besides what better place to be than gathered at the NJ Horror Con #2! Consider by many as a Horror Historian, writing detail reviews on many sites, with the first horror I ever saw was Grizzly (1976), from there I discovered Vincent Price and Christopher Lee movies, and of course Universal Monsters. I never watch the films just once, no rather multiple times, as I got older become both a completeist (the goal to watch all the horror films possible) and started to research many films to new depths of interest. Many of my reviews contain vast amounts of details about each film, in a fair review. In addition, a screenwriter and actor and producer of Blind Documentary, called A World Without Boundaries, and podcast DJ of 4 weekly shows 2 metal and 2 horror theme. Enjoy all things Horror, Gothic, and Macabre. Favorite Quote of Mine: "The Extreme Makes a Lasting Impression!"